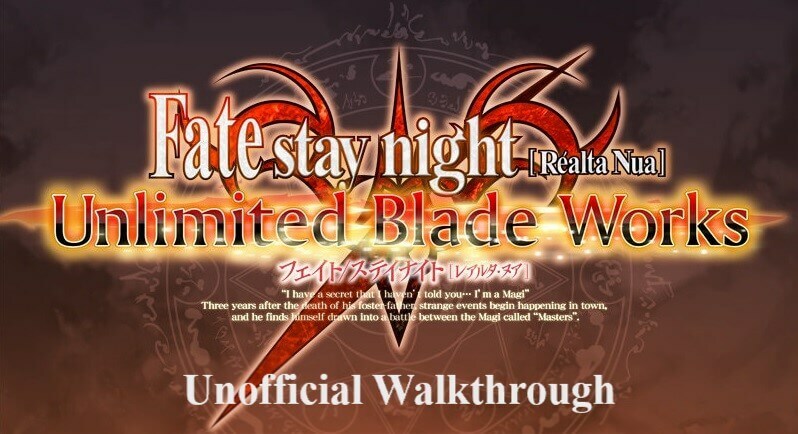 A 100% walkthrough of the Unlimited Blade Works route of the Fate/stay night visual novel including all CGs, Tiger Dojos, and an efficient single pass method for achieving both main endings. 2. I’ll go to work. 3. I’ll play with Fuji-Nee. 1. Stay at the archery range. 1. I'll go see how Saber’s doing. 2. Jump back to the hallway...! 1. Can I hand her my Command Spell...? 3. I can pull out this “nail” in my right arm...! 1. I can't say for sure. 2. I’ll go see how Sakura's doing before the sun sets. 1. ...She’s after me. I'll give up and go out there. 2. Use the Command Spell to call for Saber. 2. ...It’ll be pointless, so I guess I won’t ask. 3. Meat’s on sale today. I’ll make a huge meal to make Saber happy. 1. It's too dangerous. Stop Tohsaka. 1. I have to talk to Tohsaka. 1. I’ll make Japanese food in that case. Actually, I’ll go take it out on the culprit. 1. Meet up with Tohsaka. 2. ...Not yet. I can’t act so recklessly. 3. We can’t do this by ourselves. We’ll cooperate with other Masters. 2. ...I don’t mind, but under one condition. 1. ...What’s wrong with stopping them if I can? 2. ...No way, I can’t give up so easily...!